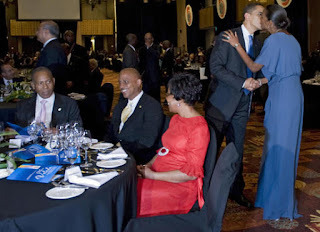 President Obama kisses Belize's first lady Kim Simplis-Barrow, in blue, during the official Summit of the Americas dinner in Port-of-Spain, Trinidad on Saturday night. Seated at the table are Trinidad and Tobago's Prime Minister Patrick Manning, Belize's Prime Minister Dean Barrow, and Trinidad and Tobago's first lady Hazel Manning. Thanks Linda, I am always looking for ways to improve my baking. Thanks for pics of Obama and First Lady of Belize.